The issue of gun control divides public opinion - each side has many followers, each having its own respectable arguments. But the modern world of technology adds fuel to the fire, as now everyone, even in countries that forbid guns for their citizens, can have their own firearms - printed on a 3D printing machine. How will the invention tip the balance between society and power? Will it unleash havoc, or bring freedom? And the man who created it - what personal ideals does he hold? Well, we ask him himself. Cody Wilson, the creator of the 3D-printed firearm dubbed “The Liberator” is on Sophie&Co today. Sophie Shevardnadze:Cody Wilson, the man behind the design of first-ever functioning 3d-printed gun. Cody, it’s really great to have you on our show today. So, just in a nutshell, why did you make this gun? 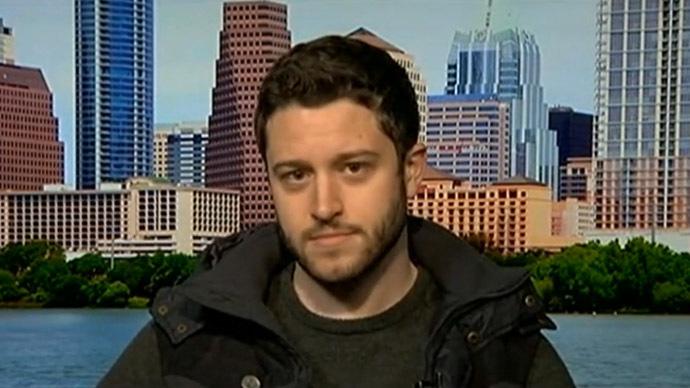 Cody Wilson: The gun was, I guess, a really great & visual example of political thought-practice. We didn’t just wanna talk about the way we imagine the future, we want to invent that future, and then project it into Internet and have the world to deal with it. SS:But then, you know, I’m thinking, obviously, you wanted to shake things up, but there’s so many way to shake things up - why a gun? You could have done anything, you could have done a 3d-printable affordable pacemaker for example. CW: I’m not thinking about product design, consumers, productivity, demand. I’m not interested in creating a product to be consumed, I’m interested, again, in changing the coordinates of certain political realities. One of them that’s close to my heart and the hearts of my partners is the gun issue in America - specifically in America, as, you know, conceived in the U.S., where we did it. At a time, the U.S. government was thinking about banning assault weapons and further restricting the ownership of firearms in society. We thought, “you know what, we could be more effective than politicians at certain degree”, we can even blunt the paradigm in publishing plans to an infinitely replicable gun on the Internet. And so we thought, “ok, instead of becoming a politician or voting, or doing the traditional forms of political action, we can just attack instead of doing things any other way. SS:So I understand the whole notion of the “Liberator” as I understand is to undermine the power of governments, establishment, to democratize things, so tip off the balance, basically, give more power to people versus the state. But then what you get at the end of the day? I mean, one of the consequences is that you’re labeled one of the most dangerous men in the world. When you were getting into that thing - were you thinking about it at all? Were you ready for that? CW: It kind of happened in reverse, actually. I mean, in December 2012, Wired magazine named me one of these dangerous people. This was while I was just talking about printing a gun. I did print a gun almost 6-7 months later. Honestly, the thing for us is that, yes, there’s this, we named it “The Liberator”, there’s a bit of historical poetry there, but when you do a bit of digging, it’s a wartime psychological operation. What the thought the Liberator was at it’s most essential is a signal of a future and of a consequences of the distribution of digital manufacture. It’s not necessarily a gun-specific project. I’ve often talked about Defence Distributed as not even being a gun project. Really, it’s kind of blunt way of demonstrating the anarchist potentialities of distributed manufacture and digital manufacture. SS:Right, but we’re talking right now about a gun project, which gives the whole notion a particular edge, I would say. Is the society ready for the liberation you’re bringing it to? Maybe, you’re a bit ahead of your times, don’t you think so? Because I’m thinking, a regular folks are for the most part uneasy about the possibility of anyone making a deadly weapon at home. Do you know what I mean? CW: Yeah, but I think most people are a-political, and their opinions aren’t really even worth counselling. I mean, in fact, it’s not consequential whether they’re comfortable or uncomfortable with what certain activists do. Most people just abide. So, we’re interested in pushing at the margins of technology, at the margins of politics in this environment that we believe is somewhat post-political. U.S., as a warfare surveillance state has an oppressively strong Cold-War era regulatory export apparatus among other things. It wants to manage the Internet, it wants to spy on every government. It wants to have every partner in a world bend a knee, and we believe that that’s not the only role, not the only player in society. There are other ways to do political projects. CW: I’ll tell you - at first the project couldn’t even get any attraction in the U.S., because there’s a much high level of comfort with guns in society, and so the only kind of attention was from the German press, the UK press, you know - the Guardian, the Telegraph and of course, some Russian press as well. It’s a much more jarring things to the European populations, especially Western Europe in its kind of late democratic convalescence or something. I think, though, it demonstrates the points a little bit better. It doesn’t even matter if there’s a social or political consensus - there will be guns in the society, and it’s just an intense way to demonstrate that. This is either something you can adjust to or something you can prepare for against even harder, but the consequences and the means to do that become much more oppressive and restrictive. SS:But when you say that this notion of Liberator is something beyond politics - it still creates a society with no control. How can that work? CW: Oh, no, very much. I think, this is one of the big axis of debate for the future going forward. Will there be managed and planned economies in the way that we’ve traditionally conceived them, like in the early XXI century or the late XXth? Social control is something less achievable, especially as the means of production both cultural and material are distributed to most of us, to the common men. How can you have programs of mass… especially, manufacturing control, or distribution control, or just like how the personal computer into everyone's homes, anyone can become a blogger, a journalist, a producer of culture. There are no ways of neatly managing these strings of production anymore, and this applies to something very simple: simple articles, like the firearm. How could it not? SS:So, I’m thinking, you have studied law, right? You were first in your class, you were president of your class, I mean, you’re like this brilliant bright kid who got a lot of offers from Ivy schools. But what you’re practicing right now is practically the opposite of what a law would allow - how did that happen? CW: Law and allow are two different concepts. We have a system of laws and then we have an idea of social toleration and so… I mean, you’re asking a kind of mixed question. I believe in society of laws, but I don’t necessarily believe in a society of proscriptive, prohibitive checks on potential behaviours. So, if someone takes a gun, let’s say they print my Liberator and shoot someone - it’s an extremely impractical and expensive way to shoot someone - but if they shoot someone, then they should be dealt with as a murderer or someone who illegally owned a firearm according to a certain community’s law. It doesn't need to be a kind of extra-standard of laws or checks or social gateways that just prevent that actor from getting the gun, because the consequences in the alternative are so bad for everyone else in society to ensure that that one person, that one actor doesn’t get the gun - you know what I mean? SS:Yeah, but what if society decided that it needs checks on guns? CW: Well, here’s a question - can we really say that society as an organism can make a kind of coherent or comprehensible decision? I don’t really believe in fictions of social contracts, I believe that’s just a kind of mythology of power. Thats’ how we explain to ourselves that we elected rulers. Is there such a thing as social decision, a political consensus? No, these are fictions. They describe what’s happening, they describe how powers function in society, and we’re trying to blunt power in some of its mechanisms. SS:So it’s almost like you’re making decisions for the society? CW: You can say that, like in UK they say “we’re a gun-free society”, they bear that with some pride, like it’s an element of Britishness or something, and then you say, “well, there’s a gun on the Internet and you can have it if you want it” - that does seem to offend some type of cultural sensibility, yes. But, the future’s going to be like that for people, there aren’t going to be regionalistic and nationalistic ways of making a social decisions when the individual has more capacity to do what you will, enabled by network and distributed technologies. SS:Now, I’ve read a lot about you and it seems like you are up for anything that is forbidden. You’re even said it yourself that you criticise everything - do you approve of anything at all? CW: What’s interesting, right, like, those things that are forbidden and withheld from us - that’s just an element of human curiosity, right - I can only say that I’m just so curious and romantic in that regard. What’s worth pursuing? The things that are normally told to us that we can’t pursue. SS:I mean, there are the economic giants like Goldman Sachs that you don’t really like and you’re sort of fighting with your idea of Liberator, you call them “banksters” - how exactly does your activity hurt them? Do they even know that you exist? How’re you hurting them? CW: I’ve seen the Investor Newsletter where they talked about 3d printing and then might reference the Liberator. No, there’s no direct action, like “fighting” Goldman Sachs - although we’re critical of organisations like this, they say, it’s too big to fail, there needs to be institutional providers of liquidity and credit that supplement the business cycle and help America as an economic giant to stay strong, to use its nationalistic patriotism to kind of keep the little man dominated. But I don’t think these commercial banks and these players and the “robber baron 2.0” system - I don’t believe that it’s necessary for the functioning of the thriving, I don’t know, neo-America. Am I doing anything directly to undermine them? Maybe, with the bitcoin project, but this the interview about 3d guns, and so that’s off-topic. SS:Now, everything that you’re describing to me, talking to me about democracy and your ideas of why the Liberator should be out there seems like that you don’t even support the concept of democracy, right? You’re more of an anarchist? CW: I’m critical of it. If people want to live in a democratic society or organisation, they need more power to them. Free associations are a beautiful thing, but as, especially, western late-capitalist democracies are concerned - no these are oppressive superstructures which are leading towards autocracy and relative totalisation in terms of state power. SS:Well, then what is your ideal, how would you change the system, except in America, where you will be just arming everybody who’s already armed - because, everyone has a gun in America, so how would you change the system? CW: Defence Distribution is not about personal armament, the first thing you could do to get a gun or arm is not Liberator, the Liberator is kind of like Wright-flyer of an alternative future, alternatively conceived. “It wasn’t supposed to happen!” says the progressive. “How do this come to be!”. My alternative would just be Balkanisation - there’s an American concept called “federalism”, which is the idea that distribution, smaller centers of power, lead to better outcomes - just socially speaking, not even politically speaking here. If there can be smaller petty-tyrants instead of larger fewer tyrants, this is a better outcome for common men. CW: Literally, government is better at smaller municipal levels, rather than a state level, better at a state level than at federal level, do you know what I mean? SS:But wouldn’t it be like going backwards in history, because we all started as tribal societies, we’ve progressed into federal societies - so wouldn’t it be like regressing back to the past? CW: Who’s to say we haven’t regressed already? I look around the economic situation today and think to myself: “hm, isn’t it kind of like Marxist feudalism, or something? Am I really not just a serf of some type of money class?” I just have better entertainment, I can watch Game of Thrones, but am I not still dominated in some sense? But to take that joke away and to be more serious, the idea that you’re projecting is ideological, that there’s some sort of linear history to progress, that that history is kind of moving in stages of development. From my perspective, I’m seeing nothing but a train in perpetual derailment, retrograde, abuses of liberties, there is no concept of real human rights, it’s just something we use to go like: “bomb Iraq”, or “take over a country”. I’m seeing a slide towards barbarism, not towards civilisation that you’re implying. I’m doing everything I can to maintain the distance that separates us and keep our humanity as individuals. Among those things that I think are essential, is maintaining the capacity for self-preservation and ideological conflict. The Liberator, I think, is a great prop in that conversation. SS:You always talk about Liberator as a concept, as if it wasn’t like a concrete thing that you can actually print out and hold and put in action, so I’m going to talk about it as a concrete thing. It’s called the Liberator for a reason, like you’ve said. Who has it “liberated” so far? CW: It’s called Liberator, so you can use it as verb - it can be liberating device. You can kill someone. You can also use it to begin a discursive practice or free your mind. I don’t mean to be like Tim Leary for you here, but basically, the question is kind of abate, “has it liberated someone” - no, I mean, especially as we traditionally conceive how liberation functions in a modern world. No, it hasn’t been used to overthrow governments, or used in terrorist act against some kind of rogue state. That hasn’t happened. But, yes, that is a real thing, I just shot it this morning with National Geographic. It sparks, it’s living, breathing mechanism, it shutters, it almost breaks, it’s a real gun, it functions, it’s a very physical thing, but it’s potentialities, what’s exciting about it, what grips you and seizes the imagination - it’s not its raw physicality, but it’s everything that it suggests. SS:Yeah, the potentiality blows my mind personally. Let me ask you this - are you ready to go to prison for you ideas and ideals? CW: I have no need to be a martyr. If it needs to be some kind of “ooh, are you principle enough to stand when they tell you to denounce what you believe and go to jail” - that’s not happening. I don’t intend to go jail and people practicing in this space, digital ever-turning radical space - they often go to jail and face that proposition. A lot of the bitcoin radicals, Ross Ulbricht of the Silk Road, the largest online drug marketplace - these people are starting to pay a piper, the U.S. government is coming down hard. I think to be an activist successful in a long-term, you have to still act within the legal framework that the U.S. or other government gives you. SS:But then they were also ready to entail the consequences. CW: I believe so. It depends on who you ask. Sen. Dianne Feinstein would say “Snowden’s a coward for running” as a fugitive of justice, therefore not accepting the responsibility for what he did, and not facing the American justice back at home. You and I both know that that’s a lie, and that he did a brilliant thing by becoming a fugitive and using the power of the Russian government and these geopolitical tensions to harbor himself and continue to be an advocate and representative of what he revealed. SS:So, are you ready to be an advocate for what you’ve revealed? CW: I believe I am a somewhat sort of advocate, for what I’ve done and revealed, and continue to do, especially in the Bitcoin space. I don’t believe I’ll have to become a fugitive of justice to do that, I don’t believe I had necessarily have to overtly break laws to do that - i believe that our legal structure is so great, so large, in the U.S. especially, so entangled, that there are all these pressure-points, and contradictions and things to exploit that don’t require you to just overtly break a law and risk going to jail. SS:When I’m thinking 3d gun-printing: surely, in America that too will ultimately be regulated, no? CW: I’m sure, to some degree, but it depends on what you mean. Gun manufacturer and gun possession in the U.S. are actually well-regulated activities already. This is the frustration that all of these politicians are now encountering - they would like to regulate 3d printing of guns, but the problem is that they want to regulate the technology first, as a just a general technology, and then they are like, “Oh, right, that will be tyrannical”, and so they’re not finding any way of doing it. It’s like saying: “I can take my computer, and I create a certain kind of forbidden object”, and then a politician saying, “you know, we really ought to regulate how people use their computers”. That’s pretty tough to do in the end. SS:I’m thinking, once again, there are so many guns in the U.S. already, and they are so easy to get - what’s the big deal about the 3d printing guns then? CW: I guess, I’ll answer that in 2 ways. At first, I’m with you, actually - the gun community in America was like “what’s the deal, it’s an inferior product, it’s not as good as what I can go and buy at Walmart - what’s this project about?”, and it took them until these politicians after the Sandy Hook massacre in the U.S. started thinking about regulating certain gun articles, like magazines, rifle receivers - we started replicating these quite cheaply, and then putting the files online, and people were: “Oh, I get it, it’s a kind of backup, it’s an insurance scheme against the oppressive regulation of certain gun components”. So, that is what really seized the American public’s attention, the American gun-owning public’s attention. And then, the second level thing is to suggest that distributed manufacture means that five years from now I’ll be able to make all kinds of multi-materials, strange things to have an existence yet, in ways it haven’t been conceived yet - and it’s kind of paradigm-breaker. Your progressive gun control advocate in the U.S. actually relies upon strong American gun companies, because those are the focus centers of gun regulation. If everyone, in every home, could become a gun manufacturer, gun control is dead. SS:But do you feel the pressure from the government already for breaking that paradigm? SS:What happens if a kid is killed with a gun that you made up - this is also a responsibility, right? CW: Let’s say, what I think is most likely, if a kid or a teenager prints it out and is testing it and doesn’t test it safely and injures himself or kills himself - let’s say that, right? But, again, this is just an aspect of… you are dealing with a device which is explosive and lethal, it can be explosive and lethal, right - there’s no way of permanently changing the qualities of the object or the potential outcome - that’s what you’re dealing with. There’s no way of putting enough pads or gates and checks in between that actor and what he’s doing, in the kind of like, pure isolation of his experience. There’s no way of stopping him, and you can’t come back at the creator and say… and I love this, because Kalashnikov, up until his death anway, was the same way: blame the politicians for the wars, blame the politicians for the terrorists and deaths, how they have spread guns all over the Earth; the U.S. State Department, for example, is very good at pushing Russian munitions, other munitions, under cover of other entities, into the conflict zones, and many people die - including these children that we’re talking about right now. We shouldn’t necessarily blame the hobbyists, the inventors, the creators, the political activists just for giving us a marginal amount of access to new technologies for some kind of marginal death, when there’s a great machinery of death all around us all the time, which we are very much to be blamed for, by supporting it with our money and our votes. SS:Cody, thank you very much for this interesting insight into your 3d-printed gun world. It’s been great talking to you. Cody Wilson, the man behind the 3d printed gun, thanks a lot for being with us. That’s it for this edition of Sophie&Co, we will see you next time.